So you’re thinking about buying your kids wetsuits for a surf trip or maybe a holiday by the sea. You’ve come to the right place. 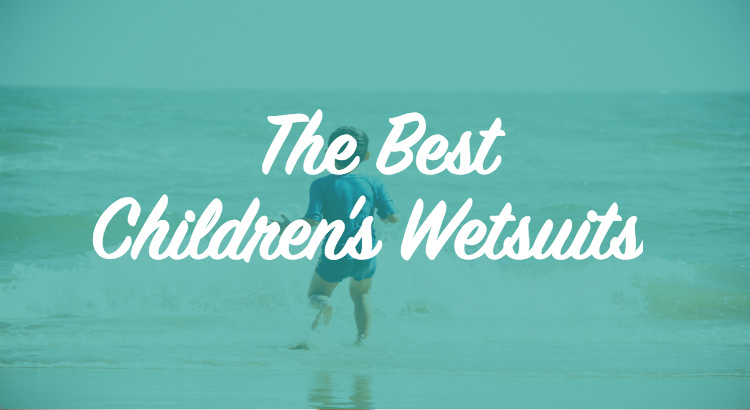 Here, we’re going to show you our top picks for the best children’s wetsuits to buy online. If you’re completely new to surfing, bodyboarding or you’ve never bought a wetsuit before and you’re not sure what you’re supposed to be looking for, don’t worry, we’re also going to explain everything you need to know. We’ll give you a rundown of what all the key terms mean when you’re buying wetsuits for children, so you’ll know exactly what you’re buying. Our picks will include high-performing wetsuits that are available for a reasonable price. We’ll tell you why they’re good, how existing buyers have rated them and much more. Which Thickness of Wetsuit to Buy? We’re going to get straight into our recommendations of the wetsuits we think will be reliable, offer good value for money and be a high-quality option. We’ll split these up into full-length wetsuits and short (shortie) wetsuits. 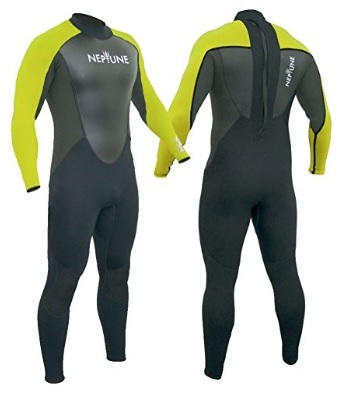 All the wetsuits we’ll recommend are made from neoprene, which is the industry standard material for producing wetsuits. Although the wetsuits are sized by age, we recommend you measure your child to ensure you’re buying the correct size. What exactly is a full length wetsuit? A full length wetsuit, sometimes referred to as a fullsuit, is a wetsuit that covers the full length of the arms and legs. If you’re bodyboarding, we’d recommend a full-length suit as they provide protection from friction on your child’s forearms as they’ll spend a lot of time leaning forward on their arms. The Glider from Two Bare Feet is a 3mm thick wetsuit that comes in sizes suitable for ages 4 right up to 16. Available in three colour variations: blue, red and raspberry (pink to you and me) the Glider will suit both boys and girls who want to pick their own style. The seams of the Two Bare Feet Glider are flatlock seams – adding to the waterproofing of the seams, stopping cold water front entering the suit through the stitching. With a 5 out of 5 review score from people who have tried and tested this wetsuit, the Gul Neptune is definitely worth considering especially for the price. What is a 3/2mm wetsuit? The two numbers can cause confusion, but really it’s very simple. The first number, in this case the 3, relates to the thickness of the chest and core part of the wetsuit. The second number, the 2 here, is the thickness of the arms and legs. 3/2mm wetsuits are the most popular type of suits among surfers. With a thicker chest and thinner material on the arms and legs, the Neptune offers warmth for your child’s body, while the thinner material on the limbs allows for easier movement and more flexibility when paddling and swimming. The second of our 3/2mm wetsuits comes from Osprey who are specialist action sport products retailers, providing high-quality surf wear, surfboards and other watersports gear. Recognising that boys and girls have different body shapes, Osprey have produced two separate variants of the Origin wetsuit – one for boys and one for girls, tailoring them to the different body shapes, allowing your child to be more comfortable in a wetsuit designed for their body. With wind protection, comfortable stretch collar material and anti-rub openings to prevent cold water flushing into the suit, it’s easy to see why the Osprey Origin gets full marks from buyers. If you’ve ever bought outdoor activity clothing before, you’ll probably be familiar with Mountain Warehouse – or at least you might recognise the name. Mountain Warehouse are a huge name, known for providing quality outdoor wear and equipment. 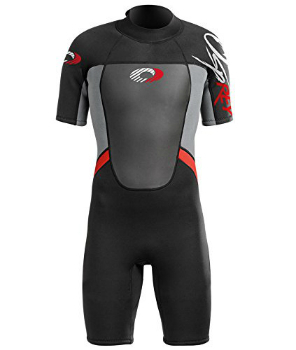 Their kids wetsuit is a 2.5mm suit, ideal for warm weather surfing or boarding. The wetsuit offers UV protection (50+) to keep your child protected from the sun as they spend time enjoying the sea. The seams have been constructed to be as flat as possible to prevent discomfort and reduce friction on the skin. If you’re looking for brighter colours and a more child-focused design, check out the TWF XT3 range of kids wetsuits. The XT3 isn’t all about design though, it’s a 3mm suit that features a mesh chest panel that helps to protect your child from windchill, helping to keep their temperature up when they’re in and out of the water. The sleeves are made from an ultra-stretch material, helping to improve your child’s movement in the wetsuit so they find swimming and paddling on their board easier. Available in wide selection of colours in sizes suitable for toddlers to 8 years old. A short wetsuit, which you’ll see called a shortie or even sometimes a spring suit is a wetsuit that covers half of the arms and legs – like a pair of shorts and t-shirt. Shorties are great for warmer weather surfing, or if your child will be wearing the suit on the beach and you don’t want them to get too hot. A key benefit of short wetsuits is that they don’t cover the elbows and knees, allowing for a more unrestricted fit and easier movements for your children’s arms and legs. 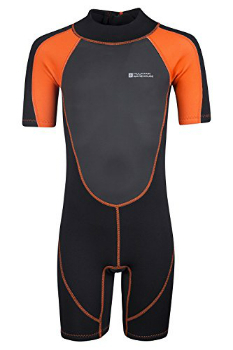 This is an ideal summer wetsuit for children if you’re heading for warmer territory or will be active when wearing your wetsuits. With a 2.5mm thickness, the wetsuit will provide plenty of warmth surfing in water temperatures in the teens. The flat seams offer added comfort to the wetsuit, reducing chafing and rubbing as your child surfs or bodyboards, with a textured chest to help reduce windchill and added grip when paddling on the board. Mountain Warehouse are offering their short wetsuit in four colour options: pink, black and orange, blue and yellow, and teal. This is a shorter version of the kids Origin wetsuit that we showed you before, offering the same benefits but this time from a shorter suit. The smallest size available will be suitable for a child between 80-90cm tall, with the largest size available suitable for a teenager 160-165cm tall. Once again this is a 3/2mm wetsuit, so will offer plenty of warmth on the chest and keep the core of their body warm, while offering more movement for the arms. Available in a range of colour, again with specific suits for boys and girls. 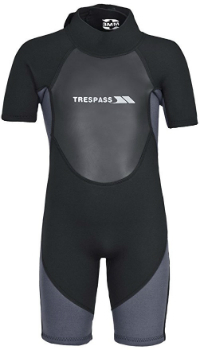 Don’t be confused by the name, this isn’t a specific scuba diving wetsuit, Trespass have just named this suit the Scuba. 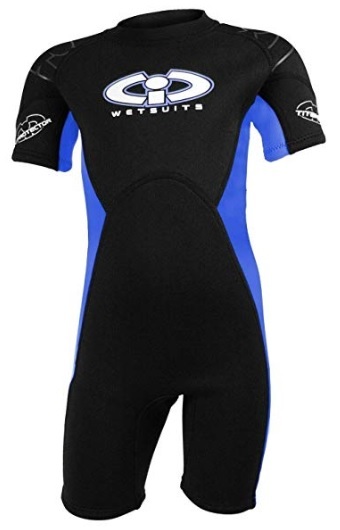 Now that’s we’ve established that this is a kids wetsuit for surfing, what features does the Scuba have to offer? This is a 3mm wetsuit, so ideal for regular temperature and still suitable if temperatures go up or down a little. The seams are flatlock seams for added comfort and less water flushing. The chest features a mesh panel for adding core heat retention and a bit of extra warmth when in the water. Once again this is a shorter version of the Glider full-length kids wetsuit that we showed you just above with the fullsuits. The same rules apply though, this is a high-performance 3mm stretch suit that offers warmth and comfort across the entire wetsuit. For a budget wetsuit, Two Bare Feet are confident that the Glider wetsuit for kids will deliver the performance of a more expensive suit, keeping them warm when surfing. This is a well-reviewed 3/2mm wetsuit that will provide warmth and comfort for your child or children when they’re in the sea. All seams on the CIC Titanium wetsuit have been double stitched, to reduce the flushing of cold water into the suit. Available in a wide range of sizes from the smallest toddlers to mid-teens, you’re sure to find the right size for your child. As well as a range of sizes, there are several colours to choose from including black with yellow, lilac, blue, pink and red. If you’ve never bought a wetsuit before, it’s unlikely that you’ll know what you’re looking for when you go to buy one. That’s okay, it’s not every day you shop for a wetsuit! Selecting the right kids wetsuit might seem complicated when you first get in into it, but we’re here to help clear some things up for you so you can buy with confidence. The two main factors to consider when buying a wetsuit is the style and the thickness. Anything after that is just bonus features really. As you’ll have seen from our recommendations of the best kids wetsuits, many suits offer the same thing – warmth and comfort, but the key thing to remember is that you want to buy the right levels that you’re looking for. Wetsuits are made from a stretchy rubber material called neoprene. Neoprene is a heat retaining material that comes in a range of thicknesses. The colder the water you’re going to be surfing in, the thicker you want the wetsuit to be. 3mm wetsuits are the most popular thickness chosen by surfers as it allows for colder and warmer temperatures. You can find wetsuits that have two thickness ratings, for example the 3/2mm wetsuits that we featured in our recommendations list. Using 3/2mm as an example, the first number will refer to the body, 3mm thickness on the core and chest while the second number is the thickness of the limbs; 2mm on the arms and legs of the wetsuit. When buying a wetsuit for kids, it’s easy to think ‘the thicker the better‘, but you have to bear in mind that your children will be playing, running, swimming, paddling and surfing in their wetsuit. Not only will this get them warm, but they’ll need their wetsuit to be flexible and allow them to move as freely as possible. As you increase the thickness of the suit, their warmth will increase but so will the weight of the suit and the wetsuit won’t be as easy to move in. At the other end of the scale, thinner wetsuits allow more free movement, but won’t provide as much warmth. This is why 3mm wetsuits are the most popular amongst both adults and children as they provide plenty of warmth from a medium thickness suit that is comfortable to wear and easy to move around in. So how does a wetsuit keep your child warm when they’re surrounded by water – sometimes even cold water? Does a wetsuit keep water out of the suit completely? No. In fact, the opposite. A wetsuit works to allow in a layer of water. The small layer of water gets trapped by the wetsuit and warmed up by your child’s body heat. This thin layer of warm water keeps the wearer warm as they surf. However, you want to avoid cold water entering the suit and ‘flushing out’ the warm water. This is why tight seams and the correct wetsuit size is important, especially when buying kids wetsuits. If your child isn’t a regular surfer, or you’re just trying it out as a family, why buy wetsuits rather just hire? There are many benefits and positives to buying your kids their own wetsuits. As you’ll have seen from our recommendations above, they’re not expensive to buy. After a few uses, you’ll have gotten value from your purchase compared to the cost of hiring. If you find that your children enjoy surfing and want to do it more, you have the wetsuit ready. You won’t have to go an hire one again. However, wetsuits aren’t exclusive to surfing. If you ever want to try other water sports out as a family, such as jet skiing, paddle boarding, white water rafting etc, you’ll have the wetsuits to hand, once again saving on rental costs and allowing your child to be comfortable in their own suit. Your child will spend a lot of time in their wetsuits in the sea. Quite often people will – how can we say this politely? – spend all day in their wetsuit, even if nature calls (in fact, this is a way that some surfers help keep warm in their suits). We’ll leave that with you, but we think it’s better they have their own that hasn’t been used by somebody else.